With the right mindset and determination, it is possible to quit smoking! I have a 94% success rate – higher than any other alternative here in New York City. Regardless of what made you start, or whether you’re smoking two packs a day or two cigarettes a week, you still have an addiction that, for the benefit of your health, needs to be curbed. The state of New York has taken a rigid “Pro-Quitting” stance in recent years, making free nicotine patches and gum readily available through 311. You can simply sign up, tell them how frequently you smoke and in 4-6 business days, a month’s supply of these “quitting aids” will arrive at your doorstep… as well as annoying phone calls from the city asking about your so-called progress. Nicotine patches and gum are tricky and do nothing to cease your addiction to the actual addictive substance. The patch, for instance, causes headaches and nausea so severe that potential quitters give in soon enough to a pack of emergency cigarettes on their lunch break during a particularly trying morning. They would prefer to smell like an ashtray than feel woozy all day. 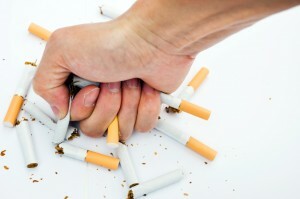 Now when you choose hypnosis in order to quit smoking, there are no nasty side effects. Yes, it will take time and effort and money. But you are also sure to walk out of my office ditching your cardboard box of the trusty twenty. You won’t need them and you won’t want them. As I always say, “if you change your thinking, you change your life!” Make the choice to prolong your life for the better. Do it for your children, your loved ones, your friends, and yourself. You deserve to quit smoking, let’s get you there ASAP! This entry was posted in addiction nyc, hypnosis stop smoking and tagged addiction, stop smoking by Dr. Errol Gluck. Bookmark the permalink.